What a busy week for the NEAC! 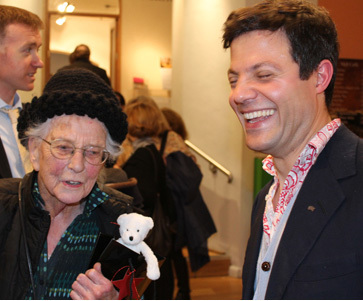 I’ll start at the end with a delightful opening ceremony at the private view that had the youngest member (bar one) Alex Fowler honouring the oldest member (bar none) Margaret Thomas. They both made splendid speeches and Margaret captured the sea of beaming faces with a very modern looking camera whilst making her speech. Margaret is ninety five, she first exhibited with the New English in 1933 at the age of seventeen, was elected to membership in 1947 and has exhibited every year since. There is a tribute wall to her in this year’s exhibition with a selection of wonderful paintings spanning her long and successful painting life. Below is a painting from her wall together with a painting of the second youngest member Alex Fowler. 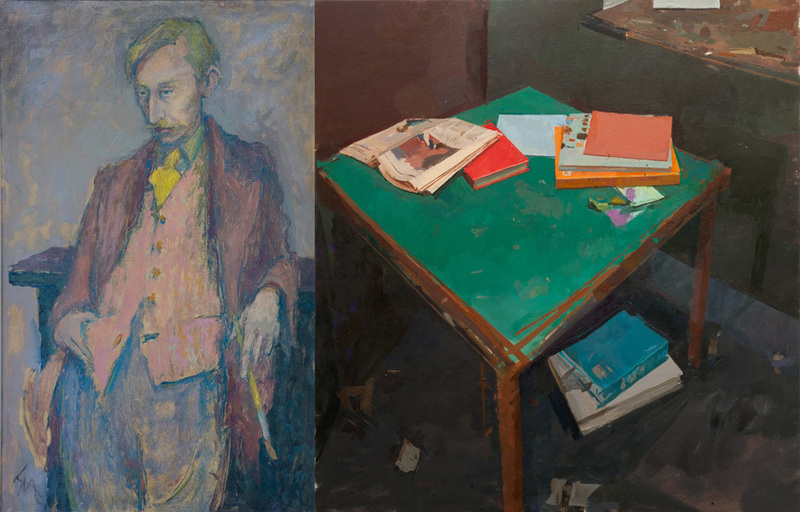 There may be nearly sixty years separating them, but both painters clearly share the ethos of sensitive, thoughtful observational painting that is at the heart of the NEAC’s membership. They also look like they were having a great time together at the party. The exhibition looks glorious, but it was a different story first thing Monday morning. I missed the hardest part of the decision making early in the morning, as my train was once again bogged down by floods in the west country. By the time I arrived the hanging committee and the hanging team had laid out 400 plus paintings on the main gallery floor and started to assemble them into hanging groups. Larger contemporary works headed off to the new Threadneedle Space, smaller works went to the North Galleries, which left a mere few hundred (or so it seemed) to hang in the Main Gallery. How it was all hung by Tuesday is both a mystery and a miracle and I was there! I imagine the process of editing a national newspaper is similar: some journalists whisper, some shout, but they all want to be heard and are jostling for space against a scarily tight deadline. The editor in chief Richard Pikesley let all his journalists and subs have their say and the newspaper hit the presses on time. A wise painting friend once said to me that you that could always tell a great painter as they make you look at the world through their eyes and see things you would not otherwise see. As I left London early Friday morning after a great private view party, I suddenly spotted a pure Paul Newland painting come to life. It was there in the glimpse of a fairground and ferris wheel through the trees in the pale morning light across the frosted green grass of Hyde Park, bright lozenges of colour against pearly grey morning light, with silverpoint sharp drawing. 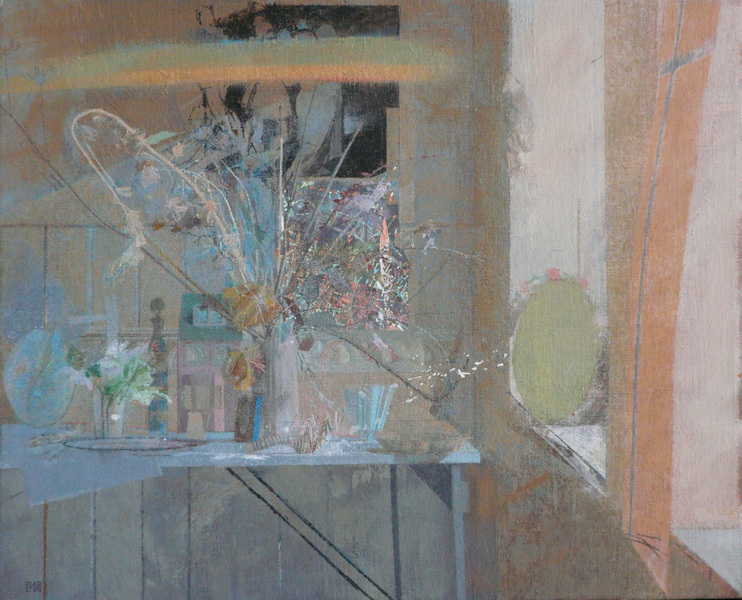 Here is another of Paul’s paintings that is in the exhibition. Come and see this and many other very individual visions of our world for yourselves throughout this week at the Mall Galleries.